The gift of the Holy Spirit revealed itself to the apostles in the speaking in foreign languages. In his book entitled Bibelübermalungen or ‘Bible-overpaintings’ Arnulf Rainer in 160 pages gives expression to the events at Pentecost in a very different way. He does not paint over images taken from art history as he does elsewhere, but makes three completely new images – as if he wants to emphasize the Holy Spirit’s unique power. One of those examples is shown above. The starting point of the image is at the top. There all lines and colours break forth with concentrated primal power and proceed to gush down onto the earth with a force like that of a hurricane. This super-terrestrial stream reminds me of the promise made by the prophet Joel that in the days that God will pour out his Spirit he will ‘display wonders in the sky and on the earth, blood, fire and columns of smokeÊ¼ (2:29-30). For the prophet these signs are full of wonder as they mean liberation. On the one hand red refers to the blood of Christ by which he released us from our sins. On the other hand red and yellow point to the fiery force of the Holy Spirit. God’s Spirit is warmth and light – light that will reveal the truth (Isaiah 32:15-17; John 16:13). He is the love of God poured out in our hearts (Romans 5:5), through which he fires and inspires us to good thoughts and deeds. To the left and right this storm of flames is accompanied by softer colour tones, lending to this bow a somewhat peaceful character. It makes me think of the rainbow, which God set in the clouds as a sign of the covenant with Noah (Genesis 9:8-17). Did not with Pentecost start something totally new, similar to the time after the flood? God gave his Holy Spirit to all people! Not only to those standing in the main stream, also to those on the fringe, as this image makes me understand. The painting arouses a longing in me to place myself in this Pentecostal stream of mercy and to let me fill anew with the God’s love, light, justice and peace – in order that I may become fully human, a human being after his image! 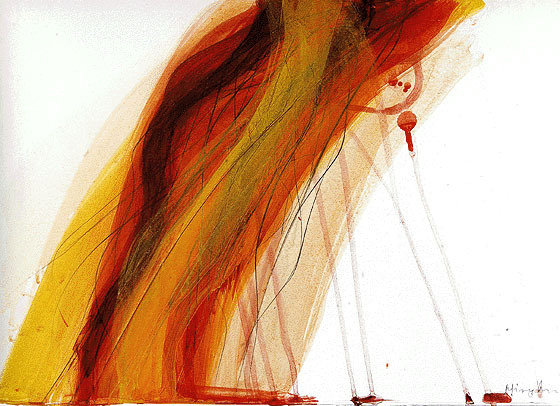 Arnulf Rainer: Pentecost, 1998, sheet of 29,4 x 24,8 cm.